Dear readers: Here is a new adventure from my good friend David Board, the flying swashbuckler. I think you'll enjoy it. The day before I flew Sundance for the first time I had witnessed what the ancient Greeks would have called an Omen! Perhaps that belies a superstitious nature in me, but I'm not so sure that it does! I saw this 'Omen' as I was taxiing after landing at the Wheeling airport. As I progressed slowly along the taxiway a Red Tail Hawk came out of the trees to my left with two small brown birds in close and hot pursuit! As these three birds passed right in front of me, one of the small brown pursuers landed right in the middle of the Red Tail's back, right between the shoulders of this great bird's wings! And I watched in awe as the little brown bird like a small feathered jockey, rode the Red Tail and began to peck the heck out of the Red Tail's head! In fact there were three of us in the cockpit that watched this drama unfold in total amazement, as the two birds took the fight almost to a crash on the ground. But at the last second the small brown bird riding the Hawk relented and took off, and the Red Tail escaped! I guess you can read into this event just about anything you like. But here is what happened to me the very next day! I flew to another small airport in West Virginia to pick up an old Piper Cub. A week or so previously I had been performing the FAA's wing strut AD on this aircraft and while the struts passed inspection as required by law, in the process I discovered some tiny bubbles of oxidation starting to happening under the paint in one or two places on the struts, so I was now taking this Piper Cub home to remove both the struts and address this problem. This by the way was not just any old airplane! 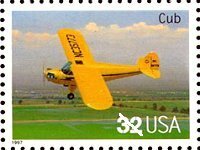 This was a beautiful 1933 Piper Cub easily recognized by the early style, three panel wind-shield. This Cub also had a name that she wore in paint on the fuselage. Her name was Sundance, and Sundance had belonged to her present owner for over 38 years or about half of her life! So, I pulled this Cub out of the hangar and after a very serious preflight, I was going to taxi up to the main ramp and fill up the tank! Sundance only holds 12 gallons and her little tank was less than half full. I was embarking this morning for an hour's flight or better and, as competent as I feel that I am as a pilot, there always exists the possibility that I could become "temporarily disoriented" which is how we pilot's describe being lost for a while! If something like that befell me, that planned one hour or so flight could end up becoming interminably longer or end on the side of a hill somewhere in West Virginia! especially when every time, seconds later Sundance's engine would up and die on me for no apparent reason. As I went about this business, I kept thinking about the Red Tail Hawk and that Omen of the previous day! What was the meaning of that Omen I wondered to myself! Maybe this starting problem is yet another 'Ominous' warning, I thought! Perhaps I am in more danger here than I realize! this vintage engine and carburetor has no accelerator pump! They were clever people back in the 1930's! Next, I took out the fuel line screen just before the carburetor. But again, there was no evidence of water or contamination there either. However, when I had removed the little thimble like fuel screen I was only seeing slightly more than a dribble of fuel at the screen and not the gusher that knew that I should have been seeing. So I began to work my way back up the line towards the fuel tank itself. I didn't have to go very far because immediately I took the main fuel line off from the gascolator on the firewall, I got the gusher of fuel that I was looking for. Now I was much happier, because I felt that I had successfully isolated the problem. Except I didn't know it yet, but I hadn't. Because I had not actually seen or identified any physical debris in the line. But I blew out the line and replaced it, and saw the gusher I was looking for all the way down at the carburetor this time. So without really knowing what the problem had been, I was reassured that everything was 'Hunky Dory' as they say, and so I reassembled everything and safety wired the screen. Now Sundance seemed to run perfectly. So after checking for contamination of the fuel supply one more time, I taxied to the pumps and I filled up the little gas tank and took off for Woodsfield, Ohio. It was pleasant and an uneventful flight and I was thinking that I had now understood the Omen of the pervious day! It must have been a simple warning! I told myself. It was an Omen telling me to be especially careful about this flight! I felt that I had been tested and passed muster! After a quick lunch at Monroe County I made arrangements to be picked up at the Cadiz airport in Harrison County and taxied out for take off again. I gave the old Sundance a full measure of power but as I accelerated down the runway the engine faltered again! Wow I thought! Now I was really spooked! The Omen was deeper than I realized! Maybe vibration! I thought to myself, and if so I would replace that cable with a longer one as soon as I got to Cadiz! And for a little more peace of mind, I wired the valve wide open for the flight, just in case! I pulled the prop through once again and now everything seemed to run well again. Now trying NOT to think of that Omen of the day before - I gave the engine full power and once again I was launched off into the wild blue yonder. Not really trusting the airplane anymore, now I climbed up to 6 thousand feet right over the airport. If the engine was going to quit I was going to be in gliding distance of a safe landing. After arriving at 6 thousand feet with no problems, I took off to the north. There were only a very few minutes while I was out of gliding distance from the Woodsfield airport, until I was well into a in gliding distance of Howe, a small grass strip just south of Barnsville. As Howe field passed behind me I could see the Barnsville airport was in already in safe gliding distance. All flights are conducted this way in a glider, more or less! Furthermore, by now the land below me was flattening out and offering lots of options to land in an emergency if another problem was to arise. So I began to relax a little. the engine on Sundance quit again and with a sobering sense of finality this time. My daughter in the little Cessna ahead of me looked like she was going to have just enough time to land and taxi clear of the runway before I was going need that runway for landing myself. But I knew that she hadn't seen me. And as frustrating as it was, I had no radio on board the Cub to call and warn her of my predicament, so I did the only thing I could do in this situation, I just went with the flow, and continued the process and thought about that Omen again! Moments later, like a slow motion night mare, the Cessna 150 did a 180 on the runway and began taxiing back down the runway towards me! My options were now suddenly, and seriously limited! The land around the airport was very rough imperfectly reclaimed strip mine and would undoubtedly lead me to wreck old Sundance! She would probably nose over and end up on her back! Not a nice thing to do to a 74 year old lady! Then as I got closer to the airport I saw for the first time that there was someone on a tractor cutting grass on the north side of the runway and I was suddenly wondering about the feasibility of hitting the runway just ahead of the Cessna and bouncing this old Cub right over the Cessna and its spinning propeller like an Evil Keneval stunt! There was a very narrow taxiway on the south side of the runway, but there was a Golf cart pottering down it! So I was reduced to weighing the options of a ground loop or a nose over in the rough grass when suddenly I could see that the little Cessna had picked up speed. My daughter must have seen me coming in to land at last and was now hurrying to get out of my way. So I continued for the runway and precisely as I flared out over the numbers, I could see the 150 clearing the runway about mid field and the runway was now all my own! It had been a close call. I know that there are bound to be critics out there who read this account from the safety and comfort of their arm chairs, and, blessed with the perfect acuity of 20/20 vision common to hindsight, they can, and will no doubt, want to tell me how they would have done much better job! And I just hope that they never have to. I had options - yes I had lots of them. Options that I have never even thought of yet! And yes, I took a risk taking off on this flight in the first place. But you can't fly an airplane, nor can you drive a truck, nor can you get out of bed in the morning without taking on some degree of risk! To be fearful of taking risks is a kind of pathology all of its own. NOT wanting or not being prepared, to take any kind of risk in life is just as morbid a pathology as risk taking itself. And trying NOT to take risks usually involves a significant degree of self delusion; the delusion is that you can take all the risk out of life, because you can't and nor is it healthy to do. The key in these situations is to be able to both understand and to live up to the responsibility of what ever level of risk you expose yourself to. That little brown bird took a calculated risk when she took on a Red Tailed Hawk. That Red Tail was ten times the size of the little brown bird. Can you imagine picking a fight with a person who was 60 feet tall? That little brown bird took on what for most of us would have been an unacceptable level of risk! But I imagine that there are a couple of little chicks in a nest in a tree somewhere on the Wheeling airport who will be sleeping peacefully because of the courage and skills of a brave mother, who was able to understand and live up to the risk she took for the sake of her offspring! She did it because she calculated that she had a greater ability than that monstrous Red Tail Hawk; a greater ability to dodge, weave and maneuver; and this gave that little brown bird the ability to reasonably take on that super courageous level of risk! Flying after all is all about risk, and it is all about energy management and through prudent energy management skills, the ability to minimize that risk to an acceptable level. But you can never illuminate risk completely. There are going to be times, weather you fly a Balloon, a Helicopter, an Airplane or a Glider, when you have to manage the kinetic energy in your ship to its maximum potential. When an engine fails you normally have just one chance to get things right the first time. There is no other option. There are times when I fly, that I know that if my engine fails, I have close to zero options of being able to heroically save the day. Flying the North Atlantic between America and Europe in any kind of airplane involves hours and hours of precisely that kind of risk taking. And incidentally, that includes being a passenger on a commercial transatlantic flight too. All you can do as a pilot if your engine quits in those conditions is crash as 'survivably' as you possibly can! All you can do is - do your best to stack the deck in your favor and keep a clear head on your shoulders! Think about this the next time you yell clear prop! And watch out for those Omens!